You'll be £19.99 closer to your next £10.00 credit when you purchase A Waste of Blood and Treasure. What's this? With the Netherlands overrun by French Republican forces, the British and Russian governments sent an allied army of 48,000 men under the Duke of York to liberate the country and restore the House of Orange. 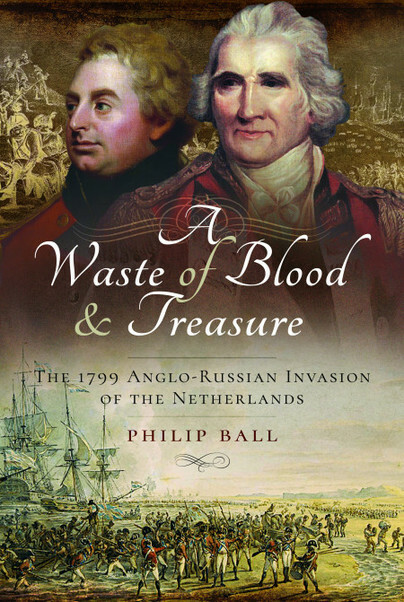 This book examines British, French, Dutch and Russian sources to reveal a fascinating tale of intrigue, diplomatic skulduggery and daring action. Spies, politicians, sailors and soldiers all play a part in the exciting story of an expedition that made (and broke) reputations and tested alliances. It recounts in lavish detail the series of battles fought to liberate a people who showed little interest in being saved and explores the story behind the triumphs and failures of this forgotten campaign. With A Waste of Blood & Treasure you will discover a good synthesis of a little known campaign. This really is a fascinating work on a largely unsung military enterprise, highly recommended as ‘something out of the ordinary’. Philip Ball has a long standing interest in military history and worked for a number of years in museums, archaeology and the heritage industry. Holding degrees from St David's, Leicester and Birmingham Universities he wrote his Masters Dissertation on the failure of the Helder campaign and is currently researching British maritime operations in the Revolutionary and Napoleonic Wars.